Ada is so hyper here~ If you are curious and need a final push to start supporting Replay on Patreon – two next pages are available for Private pledge backers. And I gotta tell you, the page I’ve just uploaded features the cutest Lauras I’ve even drawn (‘∀’●)♡ And I’ve posted some sketches from the incoming pages too. I’ve been only sketching next pages for the past days, trying to build a big buffer of those before September. But I plan to update the shop this week and probably get rid of some very old items in the next week. I’ll post a notice here when I’m done adding new stuff. If there’s anything you’d like added just let me know in a comment. And if you are a patron and want a bigger resolution of something just send me a message there. And thanks for the votes! TwoKinds and Grrl Power crushed us but you guys are awesome anyway! UPDATE: Shop has been updated! I’ve thrown a bunch of things there, feel free to take a look! I’ll most likely remove the old mugs (since the logo has been changed and everything) so it’s your last chance to get those lol Also use HOMERUN20 for 20% discount. You’re doing great, NI; never doubt it! You have incredible talent, and you are telling an amazing and gripping story. For someone at your level of experience, you are shining like a genius among giants. Omg that’s too much xD Thank you! p.s.– Speaking of the Foglios, you’re beating Girl Genius by a full order of magnitude! Keep producing Replay at this level of quality, and you’ll be up for an Ursa Major, next year, I bet! Wouldn’t that be something haha! Yeah if this is your first time then hats off to you, bravo. Keep up the good work. I’m going to try to vote for you when ever possible to try and get this comic to first place and keep it there. And thanks for the votes! They do help a lot! Grrrl Power doesn’t seem to have a very big lead, I think we could probably catch up. ‘Course there’s a lot of sleeping giants that, if they ever woke up and tried, would crush everyone above them. I mean there’s websites in the top100 that don’t have any link on their website to topwebcomics (let alone vote incentives), and still people vote for them by the hundreds. GrrlPower is just about 500 votes ahead. That’s something, but nothing that can’t be caught up to. Okay, TwoKinds will be tricky with their 10k votes ahead, but as has been said before: You are doing this for 3 years now and are third place. Tom’s been doing this for more than 15 years and TK has been one of ‘the’ webcomics for quite a while now. I don’t think there’s all that many people who read webcomics who have never heard of TwoKinds, that’s how large it’s range is. So yeah, there’s no shame to lose to a giant like that…no, that’s wrong, you’re not losing. You’re just coming in a little later, but still in the top ten…and have been for the past few months if not even years, if memory serves. Often even in first place, if I am not mistaken. Oh I’m super proud! Both for myself and Replay and for you guys, for managing to squeeze out so many votes haha~! I wonder if Replay will be so popular in those 10 years. 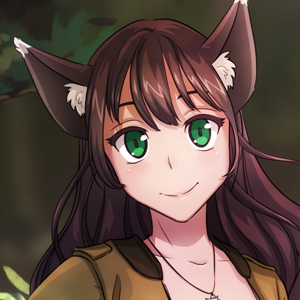 I read TwoKinds too so I imagine people who enjoy it could probably enjoy Replay too. But maybe Replay’s too bloody or something haha. We’ll see in those couple of years, it’ll be fun to observe for sure. The sleeping giants thing is definitely true. Yeah, xkcd has been in the 30s or 40s, in spite of not having a vote button, ever since I started looking at TWC. There are also a few other classics that often make the top100 without vote buttons. Judging by their Patreon success, they could probably take the top spots on TWC if they wanted. I was gonna say at least this comic has enough pages in the archive to at least warrant being on the front page, but it has been clinging near the top of the list for ages now and I’m inclined to believe that drawing so much attention to comics with less than a thousand page archive is just a waste. It’s not really a competition. And I’m too old to care about rankings, but it’s a good free marketing so I ask nicely and the kindhearted people here vote for Replay so that it stays on the top. It really does bring new readers (even though some of them have weird fetishes, for example with GLASSES). I still hope you’ll come back and keep reading, I enjoyed your comments haha. Thanks for giving Replay a chance! The top rankings are made by people who regularly follow a comic, not by those who just binge-read through archives — so the number of pages in the archive is really pretty irrelevant. I somewhat agree that this *can* be disappointing at times, since high rankings are occasionally occupied by fairly new comics that disappear or fade into relative obscurity not long after… It’s a minority, though. Would you watch a film at the rate of one frame per day? It is baffling enough that people do this at all, let alone that they’d be the majority… Oh the insanity of humanity. But I guess it is a standard they’ve inherited from paper comics and most likely television too. More things that supply plot at exactly the rate it is created, despite the medium itself being effectively timeless. Books at least get it closer to right, though this is more true of stand-alone works rather than long series. I know I didn’t touch the Wheel of Time series until it had been completed. Would wait the same for ASoIaF but it is taking forever. Rant aside though, you’re right… They’re the ones who control this sort of thing. Their madness is ubiquitous. But it is easy to forget the extended consequences of their unintuitive way of life. Popularity is independent of volume of content but dependent largely on continued regular activity, what with their viewing this as a thing happening rather than my focus on what has been done. … So… this was where I left off last time, as memory serves. I just love how Laura looks here (and on the next pages). You are always so caring. It’s okay, I take breaks when my body tells me to, so no worries! It might happen, true. I can only say that for now I have a lot of motivation for drawing this story, I like how it’s turning out and I enjoy seeing you guys comment and get excited as well ^^ I’d feel pretty lost without it, as it fills most of my free time haha! Her enthusiasm is kind of infectious! I wonder what the “key” is to who can and can’t use magic? I’m sure Robert would do anything to know the secret hahah~! I hope not – not that he tries to reason with the deamons just to find out that secret, i dont think Ada could handle that…. Ada would hate it if Rob tried to reason with demons for any reason I bet. On the other hand, trying to reason with your enemy is the magical-girl way. And beating them up until they agree to become your friend. LOL so does that make Rob a Magical Girl Warrior who believes in the power of friendship as delivered through a Wave Motion Gun? Maybe everything full of rainbows and his weapons are large sticks with flowers….. The only reasoning any sane person should do with Demons involves pointy and sharp objects. Oh and fire. Lots of fire. And then she drew a notebook. Laura is so cute looking when Kasper brings her over to Ada. Hmm…I’m certainly terrible at reading emotions. Well, I’d say there’s a bit of awe, but in a “wow, for me?” kind of way. Like being presented with a life-size statue of yourself made of chocolate (assuming you like chocolate very, very much). Something like that, I think. Yep! All of them are on the spot! And the last one is something like “ooh I’ve heard about this, I’ll get to try as well? WOW” – so pretty much what you guys said. BTW where and when did Ada get her new outfit? IIRC she was still wearing the camo fatigues and shirt before the vision, but afterwards she had on this cool black outfit. I think she might’ve used magic. And she lost gloves for two pages. I need to fix those, damn it…. I bet it’s going to work for her so Ada can go and get the other spells. After all, the vision told her that Laura was also a mage. And it was also one of those visions who told her, that the magic could work in the first place. I know soba is a type of noodles, what is yaki? I’d guess either chicken or a dark sticky sweet sauce since I had Yakitori on Sunday which was skewered grilled chicken in a delicious sauce. I also had chicken katsu curry which was tremendous. A special task from Ada delivered like this would give you such self confidence! Although also trepidation because you’d hate to let her down. Go Laura! And have you eaten “omurice”? Or made some? No, my boyfriend hates ketchup, that’s the official reason, but to be honest rice wrapped in egg just doesn’t seem appetizing for me. And I get very, very upset if I order something bad for dinner (food and sleep are two main sources of my happiness!). But Ketchup is the best!!! I know right!!! He’s a dummy. Welcome back to the food network with our special guests NI and Rateus. Aw. Look how cute Laura is in panel three! I’m a little jealous of you getting to watch those awesome fireworks. I watched one on YouTube once, but that’s just not the same. TwoKinds has this super power that lets it get 10000 votes every time Tom update’s the vote incentive haha~ And yeah, we’re #2 now! 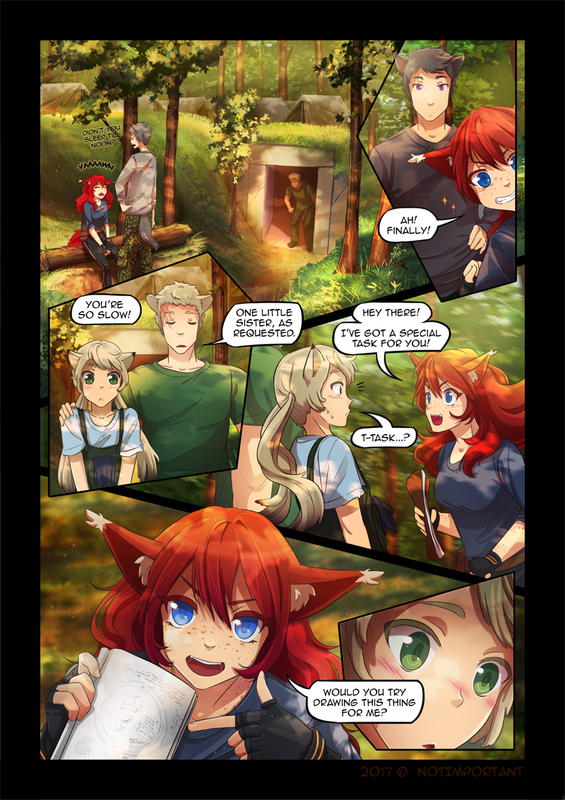 I’m a big fan of Twokinds, but I think it’s fair to say that this comic started from a much higher points in terms of artistic and dialogue quality. Tom has improved both massively over the years and built a big reader-base, and I’m sure you’ll do the same more quickly given your high quality start. I love how that doorway is like a hobbit hole, and it’s right underneath the tents! It’s just slightly fairy-tale esque, but still subtle enough to be realistic… I love it! ACs just do that sometimes… I’m not a big fan of them, even though I appreciate them sometimes, too. And don’t leave out the kitty doodle — it’s super important! 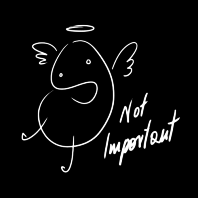 With all the demons running around I’d rather be incorporeal, makes it harder to get eaten. That first panel tho, much relate. I am Ada. Ada is me. Wow I forgot about this comic for a bit. Still real great! Ok, maybe this one is the right email? There I am! Been so long I forgot my information. It’s good to be back, and I’m going to make certain that I bookmark the page this time! Man, the names above comments look a lot better now that I’ve downloaded the “Caveat Brush” font. It looked like comic sans before (and slightly too large as well). I don’t think allowing scripts has anything to do with automagically downloading fonts that aren’t on my computer, does it? It’s a font linked from google fonts. You shouldn’t need to have it on your computer. Win10 doesn’t run it in kernel mode anymore, but I’m not sure about 7 (which I have). I suppose it should be safe to trust google not to serve compromised fonts, but I don’t seem to have the option to. Honestly, though, I don’t feel I really miss much on the web having the safety knob turned up a notch. It’s not that I’m overly paranoid, it’s just that the cost is low for me. Wait…I’m caught up already? But it’s only been an hour, maybe two! I take it that’s from our Patreon subscription level? Yep! I explained under the newest page, I just posted it 🙂 Please enjoy!